A recent report from a leading provider of office real estate speaks to five key considerations for providing and profiting from workplace wellness. Globally, life expectancy continues to improve. People are choosing to (or needing to) work longer. Maintaining core health, particularly for a workforce including more older people than ever before, is increasingly important for ensuring productivity and reducing healthcare related costs. Unfortunately, the current state of employee health, like that of the general population, is not encouraging. In fact, it is in decline. This decline has been a principal cause of the rapid and continued increase in healthcare cost. It is also impacting productivity, and not just in terms of absenteeism. “Presenteeism,” the term for employees coming to work while sick, has been shown to reduce those employees’ effectiveness due to stress, but and also to increase the spread of viral office illnesses. Beyond benefits in cost-containment and organizational output, wellness programs provide an advantage that will profit businesses well into the future: they help attract the best employees. Eight in ten employees surveyed said that the presence or lack of a wellness program would be key to their job-hunting decisions in the coming decade. At a time when skilled workers are ever more difficult to find, wellness may well be a crucial calling card. When planning for “workforce sustainability,” however, corporations need to think in terms of the whole person. Support for physical health is a given, but it should be considered inseparable from mental and emotional health – and today, it frequently is. This may take the form of “stress free” (and Wi-Fi free) break rooms or quiet spaces, to alleviate the “always-on” demands of our device-driven world; flexible work hours, and remote working arrangements, to help ease work-life tensions; and mindfulness training, to help maintain a sense of positive calm and productive focus. As the presence of Wi-Fi free zones suggests, technology can be both an issue and an asset in sustaining employee wellness. For instance, most phones now come equipped with easy-to-use apps that monitor and manage any number of health-related factors. They are also, of course, equipped with “weapons of mass distraction,” from communications to entertainment and everything in between. Wellness training can help employees be intentional and self-disciplined about exactly how they use their tech tools. What will work well for your workplace? 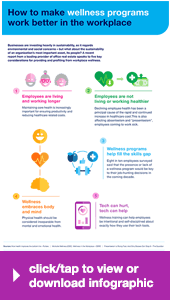 These are just a few considerations underlying wellness programs and worker sustainability. Every organization and workforce will present specific challenges and opportunities — and the first step to meeting them is to recognize that your company will not do well unless your people stay well, in the broadest sense.